Galaxy Note 5 S Pen Features - Use the S Pen to write, draw, or perform touch actions on the screen. Hover the S Pen over items on the screen to access additional S Pen features, such as Action button and the Air view feature.To Detaching The S Pen Press the end of the S Pen to disengage it. Then, pull the S Pen from the slot. To store the S Pen, push it back into the slot until you hear it click. 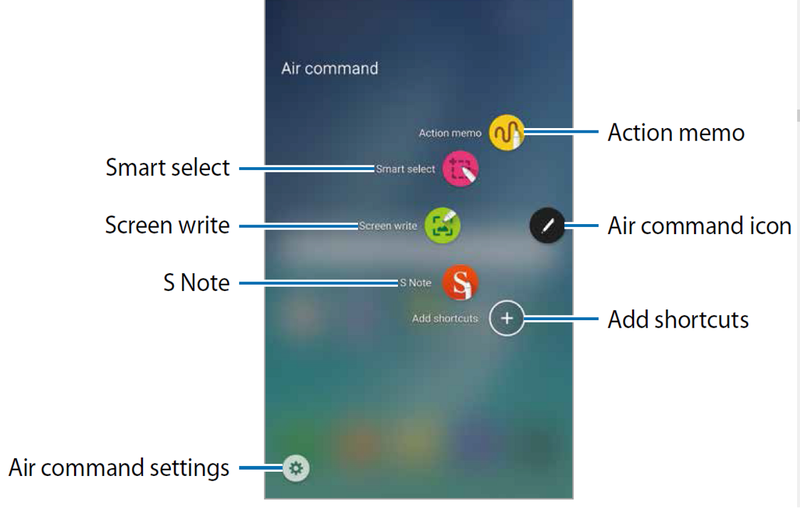 To open the Air command panel, detach the S Pen from the slot or hover the S Pen over the screen and press the S Pen button. You can also tap the Air command icon. You can access useful features and frequently used apps. When the screen is off or certain security features are activated, removing the S Penwill not open the Air command panel. When the Air command panel is closed, the Air command icon will remain on the screen. You can open the Air command panel by tapping the icon. To move the icon, tap pen icon and drag it to a new location. To remove the icon, tap pen icon and hold and drag it to Remove at the top of the screen.